If there’s one thing Southerners can do well, it’s bake delicious treats. 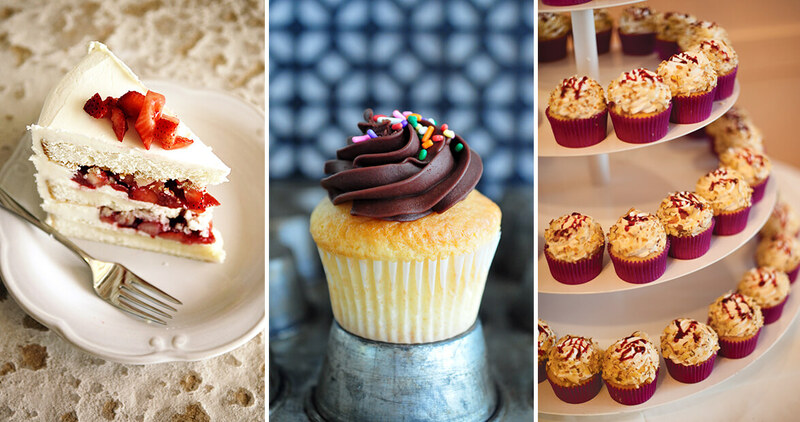 For a pick-me-up cupcake or slice of cake, visit one of these North Carolina bakeries. With more than 80 different flavors and ingredients ranging from mango to horseradish, The Peppered Cupcake is redefining dessert-eating as both a sweet and savory experience. Try the Pear with Hot Bacon Jam cupcake. A cupcake shop owned by two sisters, their fun-loving personalities shine through in their baking ethos with fun flavors like Bonita Margarita that complement traditional standbys, such as Old School Birthday Cake. With its delicate balance of fruit and frosting, the Fresh Strawberry Buttercream Cake is a favorite at Maxie B’s, nodding to the shop’s Southern baking tradition. The dessert isn’t the only thing that surprises first-time customers at FuManChu — neither is the man who makes the treats. With his long mustache and tattoos, owner Andy Jackson wouldn’t strike you as an avid baker, but Charlotteans can’t get enough of his boldly flavored cupcakes. For something different, try the Sriracha with Lemongrass. As a fifth-generation baker, pastry chef Martin Brunner has had plenty of lessons that have helped him perfect his recipes at The Bakehouse. Born in Austria, a country known for its Sachertorte, a cake so decadent, Viennese cafés have sued one another over disputes regarding originality claims, Brunner draws on European baking techniques. Try the Black Forest Cake. For the fluffiest coconut cake you’ve ever had, you’ll have to travel through time, and the 1940s-themed Hayes Barton Café is just the place to do so. As for the cake’s secret ingredient, there isn’t one, but the icing does sit for a full day, which allows enough time for all the flavors to meld. If the word “quintessential” appears on a menu, consider the item it describes a must-try. The Quintessential Chocolate Cake at the bean-to-bar French Broad Chocolate Lounge is no different. And those swirly, twirly chocolate curls the cake’s sides are coated with? They make the cake taste that much better. There’s a good reason why HappyCakes was a winner on the Food Network show Cupcake Wars: Many of the shop’s ingredients, like its caramel, are made in-house. Its Madagascar vanilla cake base and fresh blueberry filling make the Blueberry Cream Pie a favorite. At Sweet Josephine’s, cupcakes are made fresh and from scratch by bakers who start work every day at 5 a.m. The Plain Jane is the most popular: a simple vanilla cupcake recipe passed down to the owner by her grandmother. When it’s available, try the Breakfast in Bed. Its salty bacon and sweet blueberries balance each other out perfectly. Dewey’s Bakery has been honoring the homemade baking tradition since it opened in 1930. Many Twin City residents go gaga for the bakery’s fun Pink Lemonade cake squares. Across the street from Appalachian State University, Stick Boy Bread Company has been providing students with their much-needed caffeine and sugar fixes. In the warm months, try the bakery’s signature Lemon Raspberry Blast cake. Its lemon curd and raspberry buttercream are refreshing. You won’t find bread at this Goldsboro bakery, but you will find a slice of heaven. The sound of gospel music flows throughout the kitchen, as does the smell of freshly baked Red Velvet Cake and Carrot Cake, two of the shop’s signature flavors. It’s hard to say no to dessert at this lunch spot, where the cakes are often slathered with frosting right before your eyes. We recommend the Apple Spice Cake. This bakery is technically not one at all; Cupcake Delirium is a truck that is spreading the cupcake love all around Charlotte. Anything with bacon is a hit, says owner Shannon Turrell, so go for the Elvis flavor, which features a banana cupcake, peanut butter frosting, and candied bacon. Above all else, bakers at Once in a Blue Moon hope customers leave happy. Considering the café serves cake, its mission is definitely an achievable one. A favorite is the Starlight Strawberry Cake. The nuttiness of Amaretto mousse rounds out the sweetness of strawberry. This family-owned bakery makes all of its assorted sweets from scratch. If you’re in the mood for something decadent, try the Reese’s cupcake. Known for its jumbo cupcakes, Bake My Day also serves precious miniature cupcakes on its Mini Mondays. White Chocolate Banana is a go-to favorite among the regulars.